Yes, exposure to the sun for a long time is harmful to your health but that doesn’t mean that it should be completely avoided. Sunlight is the primary source of Vitamin D in humans, actually, it converts the cholesterol of the skin into vitamin D.
In the case of Vitamin D deficiency, people may suffer from diseases like Rickets and others. Therefore, you should subject yourself to a healthy dose of sunlight. However, too much sun causes skin burning, melanoma and eventually skin cancer. There are many sunscreen products in the market, which could be used to protect your skin from the harmful effects of the prolonged exposure to the sun. However, some sunscreens have the ingredients like PABA, Homosalate, etc. which pose more threats to our health instead of being of an aid. Therefore, we have come up with a list of seven natural ways to protect your skin from the sun all year long. Be sure to read it to the last. ‘Don’t go out in the sun.’ The suggestion seems a little far-fetched and farcical. However, the best way to protect the skin from the sun in any day is to completely avoid the sun at any time. Of course, it’s impractical and infantile, so instead what you can do is reduce the time of exposure to the sun as much as possible. Avoid the time of days, when the strength of the sun is at apex; usually between 11am to 2pm. If you do have to go out for a longer period, stay or walk in the shade as long as possible. Hint: Use a sun protection wristband to be reminded when to apply sunscreen or when to seek shade and stay away from direct sun exposure. You might have been fed up of the dress code in your school days, however if you do want to protect your skin from the sun all year long, the best way is to make good use of clothing. Wear a cap or hat with wide brims, to protect the face from the sun. Wear long sleeved shirts and pants to avoid exposure to your hands and legs. Wear a pair of sunglasses to protect against damage of the sun when you go out during the day. Also remember, you should use dry fabrics in the place of wet fabrics. Finally, use tightly woven material and clothes with darker color to protect your skin better against the sun. In one of the surveys, it was found that the person who consumes tomato more is less likely to be a victim of the sun than the one who doesn’t. In fact, the protection is greater by more than 1/3, if you consume vegetables and red fruits. Also, the contents of the red fruits and vegetables are credited to help neutralize rapid aging. Eat broccoli, spinach, peas which are rich in lutein and don’t forget red fruits such as watermelon. Drinking red wine and green tea can really help you in your fight against the negative impacts of sun. Red wine is rich in proanthocyanidins, known for their anti-oxidant and anti-inflammatory properties, which strengthens the blood vessels and helps to replenish the cell with oxygen. Moreover, green tea has ECGC, which reactivates dying skin cell. Don’t forget to drink cranberries juice, grape fruit juice as well to protect the skin from the sun. And, it’s also a great way to quench your thirst during the sunny day, a win-win. Cucumber is a vegetable but, what is so special about it to merit its own place in this list? Firstly, cucumber is rich in nutrients, water, minerals like potassium, sulphate and vitamin A & C. Especially, vitamin A and caffeic acid in cucumber protect the skin against sun damage. Moreover, the high water content also helps to regulate the temperature within the body. 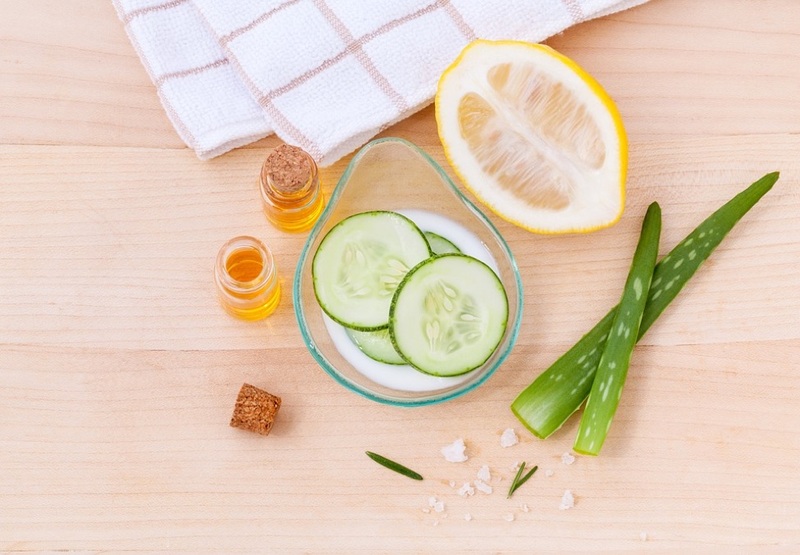 Finally, the extract of cucumber can be used as a facial mask at home as it helps to neutralize the free radicals which is the most effective way to fight the symptoms of aging. This is one of the most effective ways to naturally protect the skin from sun. Make your own natural screen lotion from the ‘inactive ingredients’ found in nature. The inactive ingredients include the natural resources like green tea extract, shea butter (plant based), coconut oil (which has soothing as well as moisturizing effect), sunflower oil and glycerin. Therefore, the next time you walk in the sun, you’d better use this natural lotion beforehand to beat the unforgiving sun. Now, active ingredients? Well, the active ingredients in nature encompass the naturally found zinc oxide and titanium oxide to make a natural sunscreen lotion. They act as the physical blocker to prevent the damage from scorching sun. Make sun screen lotion from them as they will provide a natural and efficient protection to skin from the sun by actively blocking the harmful UVA, UVB radiated from the sun.